This post is part of the Portraits of Place series. 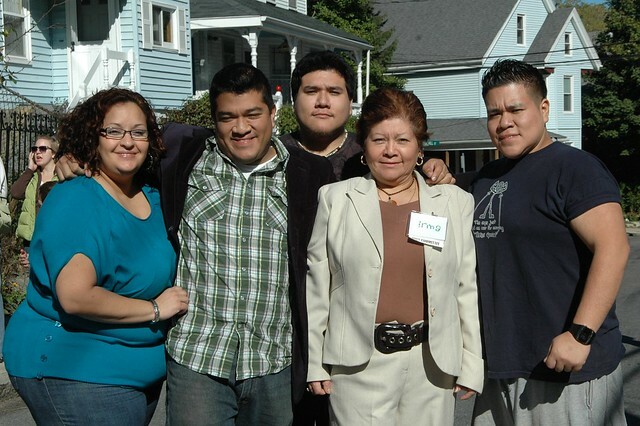 Irma Mejia, second from right above, and her family were the first people on Gay Street to have their home weatherized since Green Block efforts began there this Fall. She told me all of this as I walked through her home for the first time, prepping it for a community home weatherization, or ‘barn-raising,’ I helped organize in October. At a barnraising, a mix of skilled contractors and unskilled volunteers pool their tools, knowledge, and time together to make a home more energy efficient, similar to how farming communities used to pool resources together to build a new barn. 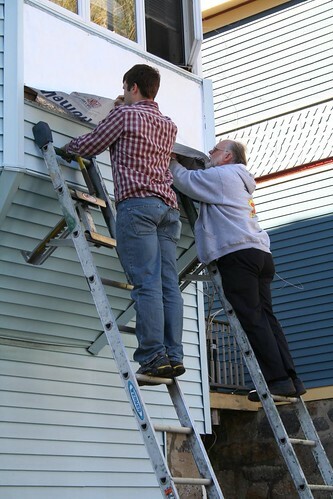 Barnraisings have proven an engaging and popular tool for getting residents involved in energy efficiency work and teaching weatherization skills, so we were hoping that having a large group event would add enthusiasm to our burgeoning Gay Head Street Green Block. During our preparations we used a device called a blower door to calculate air leakage through Irma’s building, discovering an especially egregious wall-installed air conditioner gushing a constant mass of cold air through the living room, as well as insulation installed upside-down, a leaky shed littered with skunk footprints, and numerous foundational air leaks, to name a few things. Luckily, the staff at the nearby community development corporation Urban Edge helped Irma to find finances to avoid losing her house. When we asked our colleagues there if they knew any gregarious homeowners who would be willing to host a barn-raising, they put us in touch with Irma. It takes a special hostess to handle a barnraising. 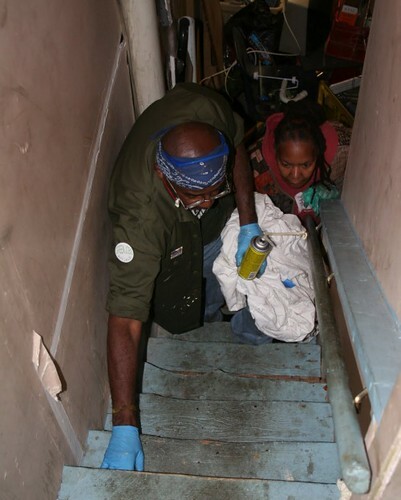 She had to be comfortable with seventy-five volunteers tramping through her rooms, seeing her stuff, and going to town with caulk, mortar, and spray foam in the place she values more than any other. But Irma was thrilled. We arrived on the morning of October 10th and Irma’s house was immaculate. You’d never have guessed she had gotten two hours of sleep by her huge smile and how dazzling she looked in her tan business suit. She was gracious with the press and seemed like she was a born spokeswoman. “I like being around a lot of people,” she explained. After the volunteers left and the leaky air conditioner was hauled away, a second blower door test revealed that the barnraising had decreased the amount of air moving through Irma’s walls by 20% – an especially large number considering the total investment in materials was less than $175. Irma will save almost that amount every year in her heating bills, but is planning to do deeper retrofits for her home, getting proper insulation installed which will result in much greater savings. We, BostonCAN, are happy to have Irma as part of our team as we strategize about how to involve residents in our program who aren’t already ‘thinking green’ or who are non-native speakers wary of being taken advantage of. Cities and groups often seem baffled as to why underserved owners don’t take part in programs like Renew Boston that essentially give them free money or services, but Irma understands their perspective. “People don’t want to get screwed over. They don’t want to have to disclose. And there are so many scams out there.” Hopefully by talking to people like Irma and seeing her example, other neighbors will learn about how energy efficiency and greening your home and lifestyle can be cost-effective, fun, and engaging. This post is the second in a series tracking Gayhead Street’s progress in becoming a Green Block. This series is part of the Portraits of Place project. I live on Chestnut and Green St. in Jamaica Plain and I want to start a green block! Way to go, Ninya and you fellow volunteers. What does community development mean to you?